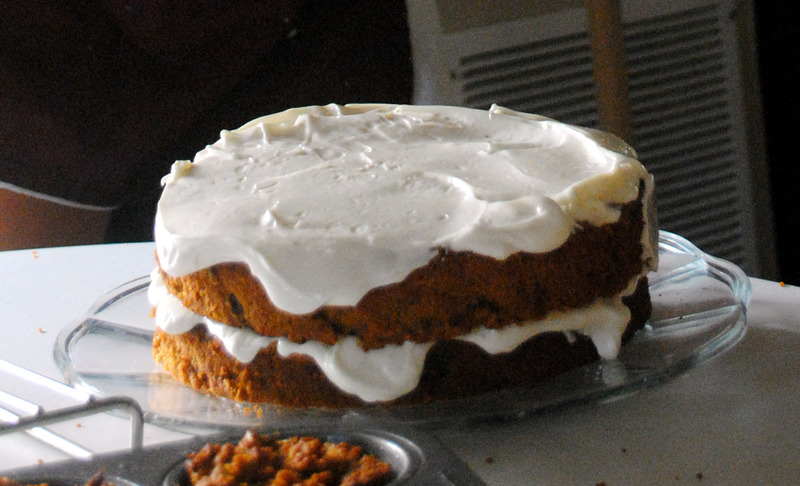 Frosting: using an electric mixer, beat cream cheese and butter in a large bowl until combined. Add the heavy cream and whip until soft and fluffy. Beat in the maple syrup and lemon juice. Add in powdered sugar slowly. Blend well. Press a piece of plastic wrap over the frosting and place in the fridge to cool while you make the cake. Note: frosting should be a bit runny. Cake: Preheat oven to 350°F. Butter two 9-inch-diameter cake pans. Line bottom of pans with waxed or parchment paper. Butter and flour sides of pan and tap out extra. Sift together the flour, baking soda, salt, cinnamon, nutmeg in a medium bowl. Whisk the sugar and oil until combined. Beat the eggs in one at a time. Fold in the flour mixture until all combined. Add the carrot pulp, ginger, and apple sauce and continue mixing. Divide the batter between prepared pans and bake for 40 minutes or until a tester inserted in center comes out clean. Flip the cakes out onto a wire rack and let cool completely. Ice the cakes. chill for 1-2 hours before serving so the frosting has time to set.